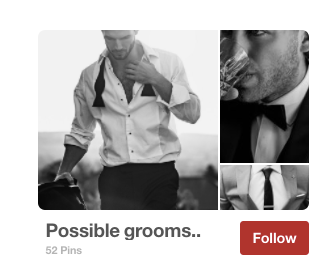 In the words of Mugatu, Pinterest— so hot right now. The company, which reportedly makes all of its money from advertising, is predicted to generate over $500 million in revenue this year, and is rumoured to be well on the way to an IPO. Over the last couple of years, Pinterest has simultaneously introduced strategic features for advertisers, such as Promoted and Buyable Pins, and established itself as a cost-effective, organic marketing channel for brands on a budget. Thanks to its first-class visual discovery tools (including the recently updated Chrome extension plugin), clean and organised layout (who doesn’t love a mood board?) and reputation as a go-to source of style, design and culinary inspiration, Pinterest is a great way to not just acquire new followers, but also keep existing customers engaged. 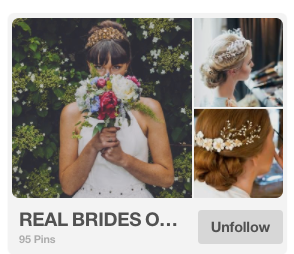 If anyone understands Pinterest’s true potential, it’s brides to be. Boards devoted to wedding gowns, suits, bridesmaid dresses, colour-schemes, venue inspiration, vintage cars and bouquets abound on the site, making it a goldmine for brands catering to those gearing up for the big day. 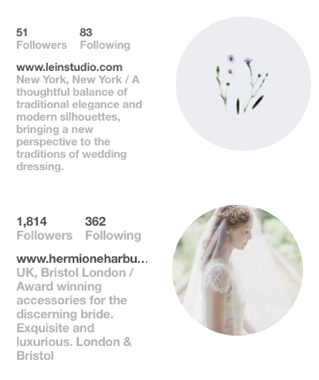 As the wedding season fast approaches, we’ve turned to a plethora of bridal brands—new and old—to discover some important lessons in the power of Pinterest for both engaging existing customer and acquiring new ones. If you don't currently have a Pinterest profile, be sure to create a business (not personal) account. This grants you access to key business features, such as promoted pins and analytic tools. For the three simple instructions needed to launch your account, check out Pinterest's guidelines here. 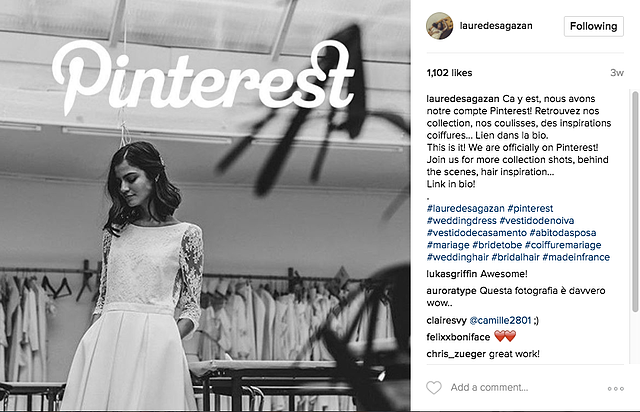 Once your brand has a Pinterest profile, let people know about it. This sounds obvious, but a surprising number of brands forget to include the Pinterest logo when they list their social icons either on their site. As discussed in a previous blog post, it’s even better to cross-promote your Pinterest account via your email marketing; for example, incorporating it into your welcome series by including snapshots and a list of reasons why a subscriber should follow you. For those who’ve spent the last couple of years building up other channels to the detriment of Pinterest, it could also be worth plugging your long-sidelined account via other social networks you have the most followers on. Top tip: If you're on Pinterest, think about the different ways you can let your subscribers/followers/customers know about it. Where would Pinterest be without pictures? When it comes to actually uploading images to Pinterest, the main mistakes brands tend to make are a) uploading images of low quality and b) not uploading enough images. 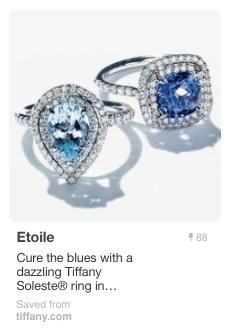 Any image you upload to (or share on) Pinterest needs to be worth looking at—otherwise, what’s the point? 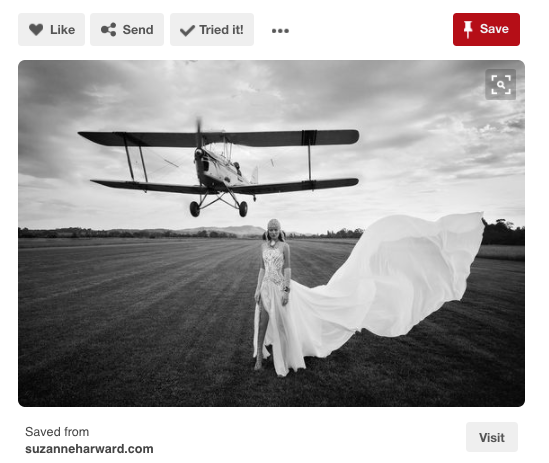 Australian bridal brand Suzanne Harward is one of our favourites when it comes to Pinterest images, with its profile boasting some pretty awesome examples of fashion photography. Despite the fact these images are promoting wedding gowns, their striking and engaging composition is also likely to attract pinners passionate about fashion, photography and design. When it comes to Pinterest, the “less is more” principle we tend to apply to other areas of our marketing doesn’t really count. This is because, unlike other photo-sharing platforms, Pinterest profiles are structured around “boards” and are thus less likely to overwhelm a follower. Top tip: Be discerning with the images you choose to share on your Pinterest account, but don’t worry so much about "overdoing it". You also need to think about making your images “shoppable”, but more on that in the next two points. From your Pinterest bio to the names and captions of your Pinterest boards, don’t think that just because Pinterest is a visual platform you can skip going all out on copy. Actually, words on Pinterest are highly important. Take the Pinterest bio, for example. This is a great opportunity to welcome visitors to your profile, quickly inform any newbies to what you’re all about, let pinners know what can expect if they decide to follow your account or even cross-promote other channels and/or share contact details. The most important thing to bear in mind, though, is how SEO friendly your copy is. Use searchable keywords that best describe your brand, product or profile, and always be as clear (but not spammy) as possible to boost your chances of a click-through or repin from a fellow Pinterest user. And then there are Rich Pins, Pins that “include extra information right on the Pin itself”. Rich Pins are available in six different types: app (where users can download your app without leaving Pinterest), movie, recipe, article (good for brands with a blog), place and (most importantly for you guys) product (real-time pricing, availability and where to buy). Product Pins can only be used if they link directly to a product landing page where a user can actually purchase the product being shown, but more on that can be found in the point below. Top tip: In a nutshell, make all of your copy SEO friendly, clear and genuinely useful. So, with copy and images in place, now what? Link back to your product page! Arguably more than any other business account on Pinterest, retailers need to optimise how easy it is for visitors to find (and buy) the product being pinned. Just imagine you're a bride(or groom)-to-be yet to find *the* perfect dress or suit. You’re having a little browse on Pinterest when—bam—there it is: the garment of your dreams. You click on the image, which has been repinned by a random, but—low-and-behold—you’re redirected to the original file. No link, no information, no dress. As mentioned in our point on copy above, Product Pins enable a retailer to include key information about a product so long as that pin redirect back to the product page. The only way in which they differ from Buyable Pins is that they are not directly shoppable. As you can see, the Pin includes the name and price of the dress. When a user clicks-through, they are redirected to the correct product page where they can actually make a purchase. But even if you don’t use Product Pins, still be sure to link all of your pins back to your product page to encourage that all-important visit to your site. Psst: Buyable Pins are only available to brands in the US who are using specific commerce platforms like Shopify, Demandware, BigCommerce, Magento and IBM Commerce. Promoted Pins and Product Pins, however, are available worldwide. More insight into the benefits of Product Pins can be found in this article from econsultancy. Whilst gazing at dresses, suits, accessories and shoes on models is fine, today it’s all about drawing on user-generated content (UGC). Your customers are bound to have both fun and professional snaps from their big day, so it’s definitely worth asking them to send those pictures to you for you to use on Pinterest. Many brides and wedding photographers blog about their experiences, so this is also a good opportunity to link back to articles or blog posts featuring your designs. Top tip: You can link back to an article by using Article Pins, which “let users know that they're clicking on a page with original content that tells a story”. Ultimately, Pinterest is a concept based around photo (and content)-sharing. Consequently, whilst issues surround copyright do come into play, the rules are a little more flexible when it comes to repinning snaps from around the site. This gives ecommerce marketers such as yourselves a fantastic opportunity to have a bit of fun with boards that take on a theme relating to (but not actually selling) your product. From wedding cakes to potential grooms to quotes about love, experiment with the boards you create in a bid to curate content that is likely to be genuinely engaging to your customer base. This is also another good opportunity to link back to articles or blog posts featuring your designs. Top tip: Spend some time mapping out what your target audience is likely to be interested in (for example, flower arranging) and theme your boards accordingly. As discussed in a previous blog post, online marketing isn’t all about driving ecommerce sales—it’s also about generating offline footfall. 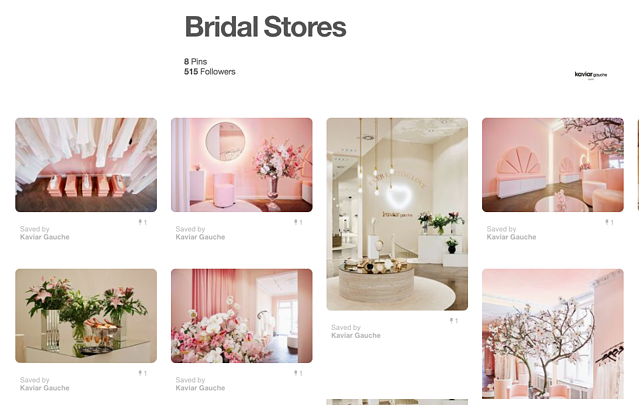 During our research for this post, we stumbled across Kaviar Gauche’s (topnotch) Pinterest account, which happens to have a board entitled “Bridal Stores”. The board gives online shoppers an idea of what to expect should they visit the store offline to try on a dress. So, if you have a particularly stylish store, share photos of it! Many consumers like to search for inspiration online before trying on in-store. Top tip: Don't fprget to include and/or link back to information regarding the location/s of your store/s. If you’re not potty about Pinterest, you might not know that it’s possible to “invite” other people to join your board, so that they can add to your board too. This is something ASOS makes the most of it in its ASOS <3’s Bridal Style board, which it shares with ASOS Insider Anna (if you’re not sure what an ASOS Insider is, check out our blog post explaining everything you need to know here). The benefits? Makes your board a little more eclectic, bringing in a new perspective on its theme. This is also a useful hack if you’re too busy to pin every day, and therefore could do with “influencers” or “collaborators” helping out. Top tip: If you use influencers, make the most of them by inviting them to collaborate on your Pinterest boards. This should boost reach and engagement. Promote your Pinterest profile just as much as your other channels. Only upload and share awesome images you think you’d target audience would enjoy looking at. Make your copy SEO friendly. Always link back to your product page, blog post, category page etc. Share ideas/inspiration/editorial related to your brand. If you’re offline store is something to behold, upload pictures of it. If appropriate, invite other pinners to “join” your board (giving them the ability to add to it).